Silver Spring, Maryland (Wednesday, February 20, 2019) – Illumina Corporate Foundation and Discovery Education, the leading provider of digital curriculum resources, digital content, and professional development for K-12 classrooms, today launched DNA Decoded, a program designed to equip middle and high school teachers with the power to unlock the study of genomics to advance the future for their students. DNA Decoded provides easy, ready-to-go, Next Generation Science Standards (NGSS) aligned lessons and activities for educators serving young learners in grades 6 – 12, enabling them to explore genomics in everyday life. The Illumina Corporate Foundation advances genomic literacy through community outreach, collaborations and partnerships, and contributions to oncology, science, technology, engineering and math (STEM) education and genetic diseases. 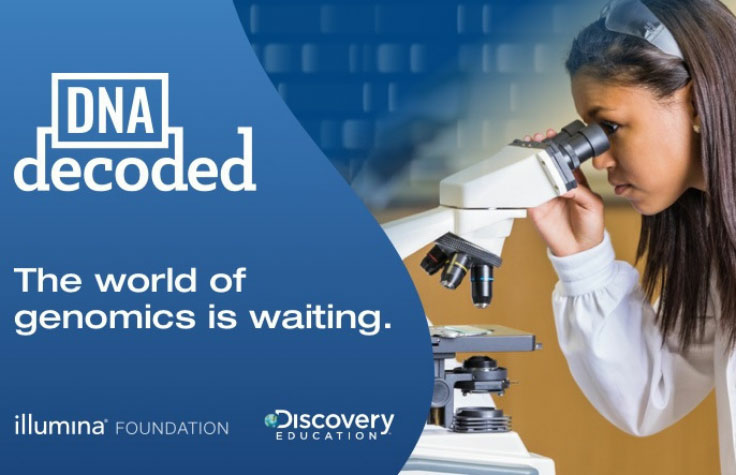 By supporting the next generation of professionals, through partnerships with companies like Discovery Education and programs like DNA Decoded, the Illumina Corporate Foundation is paving the way, to inspire youth to pursue careers in STEM. The Illumina Corporate Foundation is committed to sharing the promise of genomics with communities around the world. Toward that end, DNA Decoded focuses on empowering educators with digitally immersive tools that bring genomics to life in their classrooms. With standards-aligned digital curriculum resources, students across the U.S. will be able to study how genes interact and they will apply the study of genomics to real-world challenges, helping them to realize the hope genomics represents in rare and undiagnosed diseases. The Illumina Corporate Foundation and Discovery Education created DNA Decoded to provide students with engaging digital resources to apply genomics solutions to the challenges for everyday life. DNA Decoded aids educators and learners in examining how STEM professionals use genomics to fight diseases, such as sickle cell anemia and cancer, as well as to boost the health of the world’s food supply. DNA Decoded also helps school communities learn about the impacts of DNA beyond ancestry and gene traits. Students are able to leverage newfound accessibility to genomics by exploring careers in STEM through these stimulating activities and an accompanying educator guide. DNA Decoded resources are available at no-cost at dnadecoded.org and are also available in Discovery Education Streaming. For more information about Discovery Education’s digital curriculum resources and professional development services, visit discoveryeducation.com. Stay connected with Discovery Education through social media on Facebook, Twitter, Instagram and Pinterest @DiscoveryEd. The mission of the Illumina Corporate Foundation is to share the promise of genomics with communities around the world. We are focused on helping educators bring genomics into their classrooms as well as helping patients understand the hope genomics represents in rare and undiagnosed genetic diseases and cancer. To learn more, visit Illumina, Inc. at illumina.com and follow @illumina.